You can choose to request a reference from anyone on Linkedin. Once the request is actioned this reference will show up underneath your certificate. Promote your new skills by adding your Allbase accreditations to your Linkedin profile. You can quickly and easily insert an image of your Allbase credentials into your webpage or blog post by using the image. 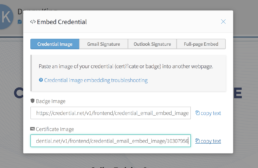 If your credential has a badge, you will be able to copy the URL of your badge image. If your credential has a certificate design, you will be able to copy the URL of the certificate image. If your credential does not have one of these designs set, it will appear disabled. Copy the location text of the image you want – the URL – and embed it anywhere you like.